My family recently purchased the Maytag Epic white front-load washing machine (model number MFW9800TWH) from our local Lowe?s store, and we have been highly pleased with it?s performance. Since it is a front-loading washing machine, we are able to fit pretty much everything we need to wash, and it has reduced the number of washing loads we have to do each week because of its high capacity. It handles delicates and bedding quite well, and we have even washed a very fragile quilt that was given to us, and the washing machine truly handled it with care. I have also washed many items of athletic clothes (that were extremely dirty and smelly), and it knocked the dirt and grime out very well and the clothes had finally lost the odor that our other washer could not seem to get rid of. Even the dog likes the new washer because he can see in there and loves to bark at the clothes going round and round! It is very quiet while it is doing the washing, and it cleans the clothes very well. It has been one of the most thorough washers we have ever had, and I love how really clean the clothes are after a good wash. Since it is energy efficient, I don?t mind running it whenever we have dirty items, instead of having to wait for a full load to do the laundry. There are adjustable settings that will allow for many different sized loads, as well as different temperatures and other settings that are very useful. The setting I use the most is just the main Normal Wash one, and it seems to handle pretty much everything that I've thrown at it. I have had to go up to the Heavy Wash setting only once, but that was for some clothes that had gotten extremely dirty after a game of football in the rain and mud. I normally rinse out the clothes before I put them in the wash, so that the washer will last longer. We have called Maytag once, and they were very nice and helpful when speaking with them. We just had to call to ask a few questions, but there was nothing wrong with our washer whatsoever. 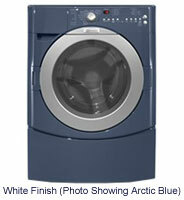 All in all, I'd highly recommend this washer to anyone!